If you are a denture wearer, there may be times when you should consider using a denture adhesive. Dr. Jason Roe specializes in dentures and helps his patients feel comfortable. Here is a short guide that goes over when you should use adhesives, when you shouldn’t, and how to apply the cream. Generally speaking, denture adhesive helps to stabilize the dentures onto the gums. This helps a patient feel more comfortable when they eat or talk. However, if your dentures are well fitting, in most cases, you shouldn’t have to use much, if any, adhesive. When taking cold medicines- some cold medications can cause your mouth to dry out, making it harder for the dentures to stay in place. Public speakers and musicians should consider a paste to provide extra security while they are on stage. General sense of security- even if there is not a large chance that the denture will come out, some people simply prefer to use an aid to provide extra stability. Those that have had a stroke, deal with neurological disabilities, or the elderly benefit from the additional stability of an adhesive. It’s important to talk to your dentist about using this type of product. Dr. Roe helps each one of his patients decide if they should consider denture cream. Start out with completely clean, dry dentures. Make sure your hands are completely dry before you handle the strip. Peel open the strip and lay it in the middle of your dentures. Swish warm water in your mouth and then place your dentures on your gums. Firmly press your dentures down in place. Wet down the denture with warm water. Sprinkle powder all along the underside of the denture and shake off the loose powder. Put in place and hold for a few seconds while the powder sets up. Clean your dentures and make sure they are completely dry before using an adhesive. If it is the slightest bit wet, the adhesive will not stick to it. Use a q-tip to apply the cream to your denture. 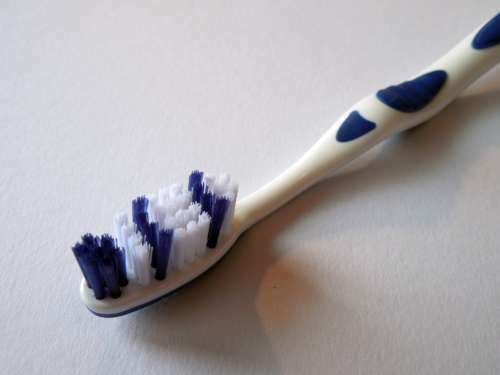 Put a small amount of adhesive on the q-tip like you would when you put toothpaste on your toothbrush. Apply a very thin layer of cream around the edges of your denture to create a seal. Avoid putting it in the middle, because it will squish out when you push your dentures down. Not only that, the adhesive can cause your teeth to sit higher. Place the denture on your mouth and then press down. The glue should set up immediately. Adhesives need to be cleaned off or your dentures as well as your gums every night. Do not apply more to your mouth until you’ve completely cleaned away the old glue. Otherwise, it will keep the glue from creating a seal. To start with, fill your mouth with warm water or mouthwash. Swish the water around so that it will loosen the product from your gums. Spit out the water or mouthwash and use a soft toothbrush to brush your gums. Use a circular motion when you are brushing. Another way you can remove the product from your gums would be to brush your gums with mouthwash. Fill a cap or small cup with a small amount of mouthwash and dilute with water. Dip your toothbrush in the cup and brush your gums, inside of your mouth, and tongue to loosen the adhesive. Rinse with hot water to remove the small balls that form. After you’ve cleaned your mouth, you’ll need to clean the denture itself. You can use the same toothbrush you cleaned your gums with to brush your dentures. Run warm water over the underside of the denture and gently brush until all of the cream is removed. Some people are at risk for denture adhesive zinc poisoning. Too much zinc in your body can cause medical problems. The FDA has received reports that people have encountered problems from using adhesives. However, they concluded that the subjects who had these adverse reactions were using 2 tubes of paste a week. A single tube should last 7-8 weeks. If you are worried about the amount of zinc you are absorbing, consider going with a zinc-free denture adhesive. Super Poligrip offers a formula without zinc. There are also organic creams on the market. Check with your provider before you make a decision. If you do use glue with zinc ingredients, there are a few things you can do to keep you from health concerns. If you haven’t had an adjustment in a long time- you should still go to your dentist for regular checkups. They will determine when you need to have an adjustment made. 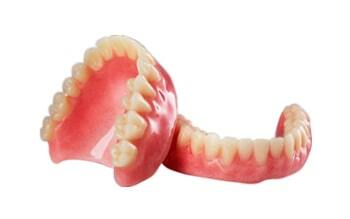 Your dentures should not slip around or hurt you. 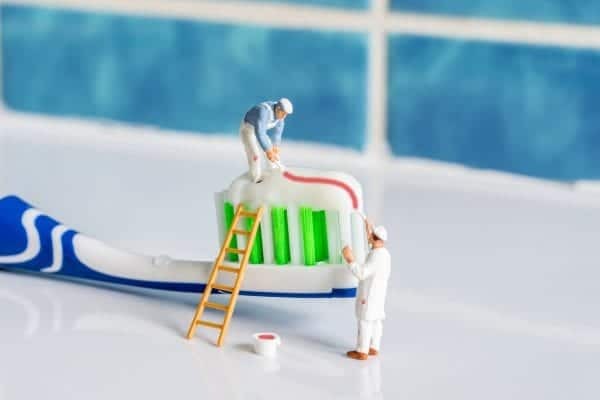 When you aren’t diligent about cleaning your mouth- whether you use an adhesive or not, you need to have good oral hygiene. You need to brush, soak, and rinse your dentures every day. Also, you need to clean off the old adhesive from your gums as well. Ideally, you should have proper fitting teeth that don’t require you to use a cream or strip. Instead of relying on adhesives as a solution, let Dr. Roe give you a better option, such as overdentures. If you’re tired of using denture adhesive, call our office today. Dr. Jason Roe will do an exam and give you options of how to stabilize your teeth. Whether you need a denture reline or want to go with implants, we can help you. Call now so we can get an appointment scheduled for you. Or, you can request an appointment with our online booking system.